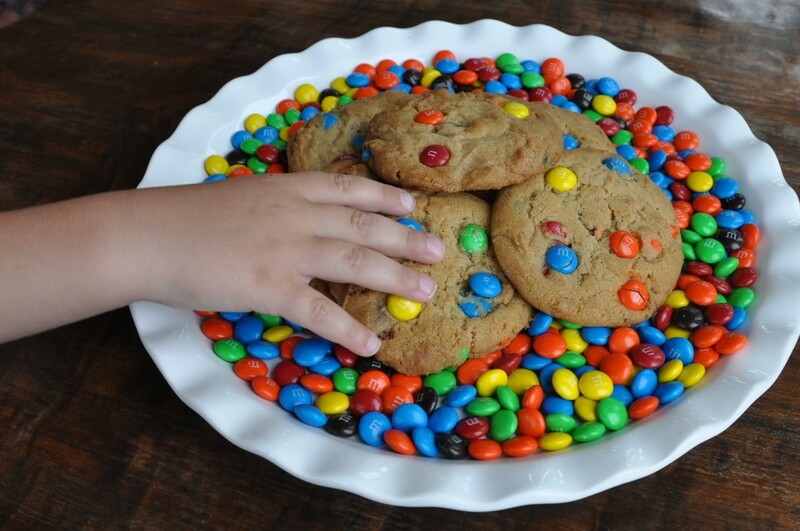 Jumbo cookies are an oversized version of a cookie, often large enough to cover the palm of your hand. Like gourmet cookies, these plus-size cookies are ideal as centerpieces in cookie baskets, as individual gifts, at picnics, or to sell at bake sales. Surprise: you can adapt your favorite cookie recipe into a jumbo version. (Check below for links to cookie recipes specifically developed for jumbos.) Because of their size, jumbo cookies beg a few baking tips. As you make cookie dough for jumbo cookies, be aware of a few caveats. Chill the dough for an hour. Refrigeration helps chill the butter and other fats within the dough, thereby slowing their spread. Scoop size. Typical cookies call for rounded teaspoonfuls or round tablespoonfuls to be dropped onto the cookie sheets. Jumbos call for 2-4 times that amount. To adapt your recipe, use a ¼ cup or 1/3 cup measure or even a muffin batter scoop to create individual cookies. Spacing. Two inches apart – that’s the standard rule of thumb when using a typical cookie recipe and placing the dough on baking sheets. Jumbos need a bit more room. Try three inches apart or more. Best practice is to limit cookies to six per baking sheet. Thick dough or chilled dough can prevent too much spread, but can also bring on a different problem with these big boys: little to no spread. To see if this will be a problem for you, check your test cookie before baking the entire batch. If your test cookie comes out of the oven nearly in the same shape as it was going in, then you can help along the baking process (not to mention the cookie’s appearance) by flattening dough before baking. You can flatten the cookie dough using the palm of your hand. However, cookies will be more uniform in appearance if you press them down with a flat surface, such as the bottom of a small plate or bowl. Often thick dough is extra sticky. To prevent a mess, spray the flattening surface with vegetable spray or mist it with water. You may need to re-apply the spray after flattening several cookies. The time range for oversized cookies is longer than their regular counterparts. If your jumbo recipe says “14-18 minutes,” understand that the range allows for differences in ovens, variations in measuring ingredients, and weather conditions. Set your timer for the lowest amount specified in the recipe or even a minute or two lower. When the time is up, check cookies to see if the edges are browned. If the edges have not become the least bit golden, bake the cookies a minute or two longer or until there is a bit of color. The center may appear undone but that's what you want. Oversized monsters need plenty of cooling time. They become firmer as they cool. If you remove them from the baking sheets too soon, the cookies may break apart. Let cookies sit on baking sheets until you can safely lift them with a spatula and transfer them to cooling racks without cracking the tops.